LITTLE EGG HARBOR TOWNSHIP, N.J. (CNS) — When Michael Santo returned to his Hurricane Sandy-ravaged neighborhood in Tuckerton, he was horrified by what he saw, and then thanked God he and his wife, Barbara, were still alive. When local officials advised residents to evacuate the area before Hurricane Sandy made landfall Oct. 29, the Santos, who are parishioners of St. Theresa Catholic Church in nearby Little Egg Harbor, heeded that guidance and took refuge in a community shelter set up in a school building further inland. After assessing the extreme wind destruction and flooding, the retired Santos both agreed they made the right call, but choked up with emotion when looking at the severe damage to their home. Hurricane Sandy swept over the U.S. East Coast, causing loss of life and billions in property damage, with the worst of it occurring in New York and New Jersey. Though the storm caused death and destruction, it also affirmed the faith people like the Santos have in God, and mankind. While the Santos began clearing water-damaged furniture and rugs out of their house, several people from a Methodist church offered to help, which they accepted with gratitude. Similar offers of assistance are happening throughout the region, said Father Mick Lambeth, pastor of St. Theresa. Donations have been filtering into Catholic Charities, the American Red Cross, the Tuckerton Inter-Church Food Pantry, and potential volunteers are coming to the church, he told CNS. So many offers of help came to the church, Father Lambeth decided the parish needed to organize the efforts, and parishioner Philip Cross of Little Egg Harbor agreed to head Project Volunteer. That group will help coordinate volunteers in assisting residents of nearby barrier islands in cleaning and repairing storm-damaged homes. 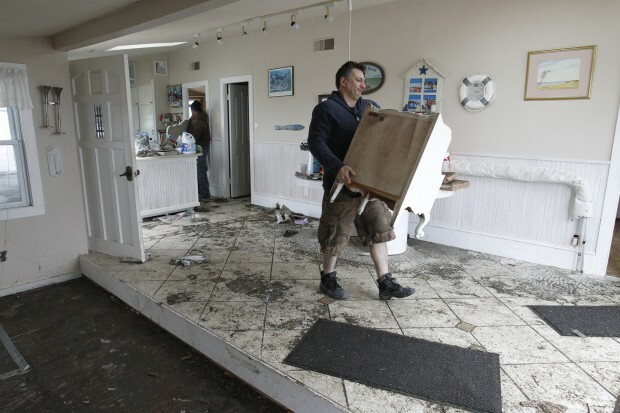 Flood damage destroyed most of Michelle Veith’s belongings in her mother’s Ventnor City home. So, when Catholic Charities set up a storm relief distribution center at St. Gianna Beretta Molla Catholic Church in nearby Northfield, in the neighboring Diocese of Camden, Veith went there for help, and to volunteer to assist others impacted by Hurricane Sandy. Veith’s offer of help was welcome news to Mark Taylor, director of veterans services for Catholic Charities of the Camden Diocese, who is one of the coordinators for relief efforts in the region. Camden’s Catholic Charities agency also has welcomed other partners at the distribution centers it has set up, such as the American Red Cross, to serve hot meals, give out clothes, nonperishable food and bottled water, Taylor told CNS as he helped give out staples to displaced families Nov. 5. 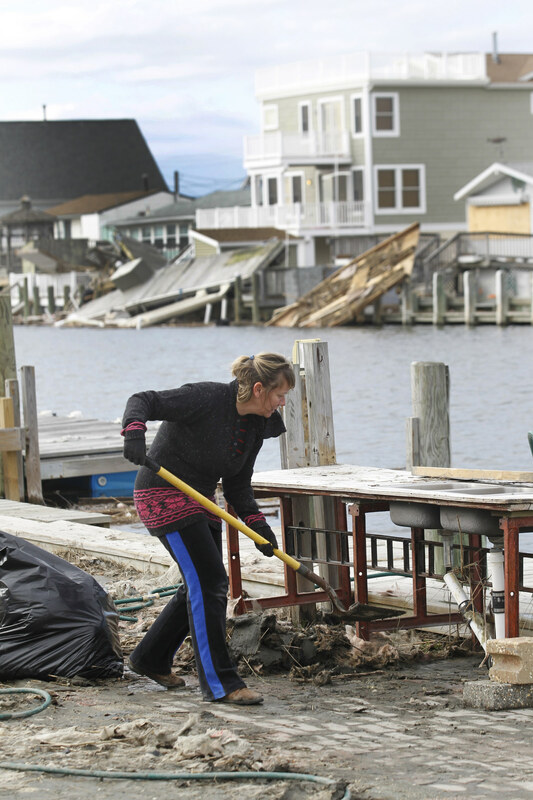 Sandra Vitelli of Orangeburg, N.Y., said the storm crushed her spirits when she arrived at her Tuckerton vacation house to find terrible flood and wind damage, but the generosity of her neighbors, friends and family who have volunteered to help her clean up has bolstered her faith. Tragic and devastating events often bring out the best in people and frequently bring people who have left the church back into the pews, Father Lambeth said. “I saw so many people this past weekend, the weekend after the hurricane, who I had never seen before, who came here just to find hope. Just to find some kind of peace,” he said. “Not one of them asked me for anything, except prayer.